Compact powerful quiet 12 volt floor sweeper for indoor cleaning on hard or soft surfaces. Counter rotating brushes pick up larger debris and filtered vacuum captures fine dust particles. Very effective on short nap carpet,tile or cement warehouse floors and recommended before shampooing or scrubbing floors. Run Time 3hours approx on full charge with about 13,850 sq feet an hour, onboard charger takes 4-6 hours for full cycle. Sweeping path is 24" wide, 12" Side Brush, 16" main Brushes. 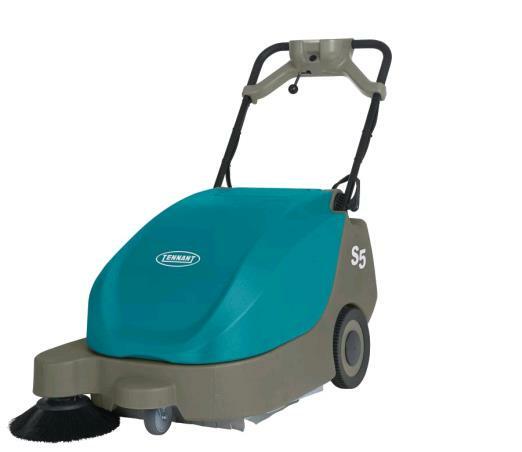 * Please call us for any questions on our sweeper floor 12v s5 tennant rentals in Portland OR, Gresham OR, Milwaukee OR, and surrounding metro area.